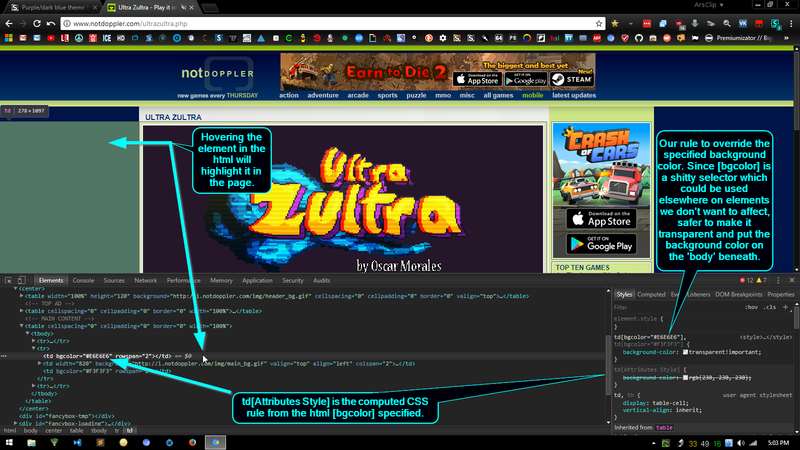 Purple/dark blue theme for gaming website. I enjoy this flash gaming website a lot, and I'd like to change the white matting on the sides to some form of darker matting. Black would do, though a similar color to the dark blue in the top banner would be incredibly well recieved. I'm looking for a hero. I used regex to exclude iframes and also the home page since it has a background image. Copy/write a new style/Mozilla Format - Import/paste/overwrite/name and save. Gorgeous! (Extra thanks for the step-by-step. You were right in thinking I needed that aswell!) If you can, could you clarify the "td" portion of your script? I've titled it Darker Doppler, if that has any bearing to anyone else in the universe. How would I go about adding or changing this script to make other parts of the page be different colors? press ctrl+shift+c to open the developer console / inspector and click the thing you want to change. Then you can see the relevant part of the site structure which helps you to formulate a CSS selector like a classname or a html tag. Knowing anagrammar, he could have, and would have...in a very informative manner. Calico, he still can. Don't know what you want to achieve with your post. I've seen many threads being forgotten or abandoned by the guy providing the solution as there is actually not more to answer. Googling for what td means isn't even worth answering for many. When I check in here and can give a fast answer, I will do that. Better than hoping for an answer two days later. If you think my answer is not informative enough, you could have elaborated more. I won't spend half an hour explaining HTML/CSS basics. If Anagrammar or Alex Carmer are upset about that and tell me, I will never ever touch a thread they answered first again. Simply put, common courtesy. If a question has been directed to a specific member, common courtesy is allowing the question to be answered by the member who was asked the question. I won't spend half an hour explaining HTML/CSS basics. Basically, this. It only takes a couple minutes to do something for somebody, and hopefully they can learn from that. Questions like "could you clarify the "td" portion" indicate that you're still unfamiliar with basic CSS, so you're really asking for a tutorial on the fundamentals in general. Not only is that a PITA, but more often than not, the more time you waste on a tutorial, the more likely OP ignores it anyway, or maybe they still don't get it because it isn't simplified enough. One day, when I'm not so lazy, I intend to make a complete tutorial for Stylus, but breaking down all the basics into countless, easily digestible demos will be quite the project. When I check in here and can give a fast answer, I will do that. ...If Anagrammar or Alex Carmer are upset about that and tell me, I will never ever touch a thread they answered first again. A generic answer probably isn't that helpful, but it's better than ignoring it altogether, which I likely would've done. Anyone should feel free to elaborate or expand upon any advice given here, IMO, especially if it lets me off the hook for any further explanation. table layouts are a pretty old-school version of dynamic CSS. They were, and still are, used mainly for grids and charts. They have many cool tricks which could previously only be achieved by using them, but they also have many odd limitations as far as not being able to specify borders and margins normally. Most similar modern layouts are switching to flex CSS, since it can achieve the same objectives without many of the limitations, but table layouts are still used, and may even be preferable for simple grids. Using them for your entire html when your site doesn't even require their cool tricks, seems to be a pretty lazy and old-school way of doing things. Not only are these selectors unnecessarily intricate, but they're fragile because they rely on that specific, consistent order of elements, which can vary from page to page. Woah. I would like to start off by apologizing for the faux pas I committed. I realize in hindsight that a literal copy-paste into Google answered my question as much as I wanted. Thank you to everyone for your considered and thoughtful help, and I want you to know that I personally appreciate it. I am grateful for all the time you did spend giving this answer, and it was honestly very informative. I eventually did have the common sense that I could google specific coding verbatim and get an answer, though, so I'm sorry for again for the faux pas. Anagrammar, I seriously love the tooltips and the explanation that goes along with them. I've fiddled around with this a whole bunch and I've realized I should just take a intro course or get a proper tutor because I do want to have a half-hour discussion about this stuff. So, again, thank you. I realize all y'all are here for a quick round of helping others and not being an on-call IT department. Thanks for all this and for bearing with me on top of it. Thanks for your warm answer, but better thank anagrammar, he certainly invested more time and provided the most detailed answers. I think you can understand that I often answer short because I never know what knowledge the questioner has and if there is a will to learn or if it's just a 13 year old asking "what that specific condensator in his phone does".